Is it the greatest spy thriller ever written? The Spy Who Came in From the Cold certainly ranks highly on best crime/mystery lists and is considered a quintessential Cold War era spy novel. In it, British agent Alec Leamas becomes part of a careful laid plan. One that even he may not be fully apprised of. It’s a gripping read. From the opening pages as Leamas witnesses the death of an agent (as the man attempts to cross the East-West divide of Berlin on a bicycle) to its climatic end, The Spy Who Came in From the Cold is a must-read for any fan of the espionage or suspense genres. “He said he would come tonight. The others have all been caught – Paul, Viereck, Landser, Salomon. He hasn’t got long.” So Leamas is told by the married girlfriend of field agent Karl Riemeck. Alec Leamas had gotten consistent results for his intelligence work until Hans-Dieter Mundt came. “Mundt’s rise to power as second man in the Abteilung” brought an end to Leamas network of spies. And Karl was the last of them. He nearly makes it through the checkpoint when everything goes wrong. Leamas blames in part: “That damned woman … and that fool Karl who’d lied about her. Lied by omission, as they all do, agents the world over. You teach them to cheat, to cover their tracks, and they cheat you as well.” It’s an ironic presentiment considering what is to follow. Recalled to London shortly after, Leamas meets with “Control”, the head of the agency. The man in charge has a plan for Leamas. “What I have in mind is a little out of the ordinary,” he says. But then it appears “they put Leamas on a shelf.” It seems the operation in Berlin had been considered “a failure for years, and someone had to take the rap.” Leamas appears to become a “drunken wreck.” He leaves the agency under a cloud of suspicion and irregularities of accounting. He winds up working at a library, where he meets Liz. An idealistic young woman, Liz Gold is a member of the local Communist Party. She and Leamas become lovers. When he becomes ill, she looks after him. Then one day he tells her, “Good-bye,” and gets her to promise not to come looking for him. The next day, Leamas gets in a row with a grocer and ends up arrested. Upon his release from prison, he’s approached by William Ashe. Ashe cultivates a relationship with Leamas, who he claims to have previously met at some vague party, all in an effort to recruit him for operatives in East Berlin. Leamas is passed through a string of contacts until he arrives in East Berlin. There, he’s interrogated to give particulars on British intelligence operations in Berlin. He meets Josef Fiedler, deputy to Mundt. In conversations with Fiedler, Leamas lends credence to the belief that someone in East Berlin is feeding information to British intelligence, “an agent from behind the Iron Curtain.” It’s a suspicion Fielder already holds, and the prime suspect is Mundt. It would appear that Leamas’ mission to take out Mundt is to get the Abteilung (East German Secret Service) to turn on him. The plan would seem to be working until Mundt pre-emptively orders Leamas and Fiedler arrested and put on trial. And a star witness at that trial is Liz Gold! LeCarré himself was an “intelligence officer in the guise of a junior diplomat” serving at the British Embassy in Bonn, Germany, during the 1950s and 1960s. With the success of The Spy Who Came in From the Cold—becoming an international bestseller—LeCarré left MI6 and began his career as a full-time author. The novel’s seeming authenticity stems from LeCarré’s observations “mostly from the confines of the British Embassy in Bonn, and only occasionally in the raw.” The backdrop of a divided Berlin—as the aftershocks of World War II gave way to the burgeoning Cold War era—very much grounds the story in a particular time and place. Yet it’s game of spies is universal. These machinations could as easily take place today with different players and diverse locations. 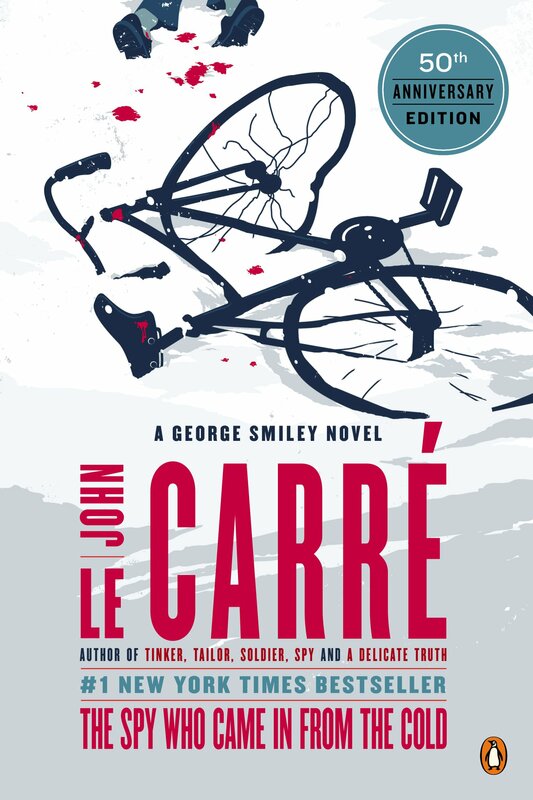 Though John LeCarré’s The Spy Who Came in From the Cold is the third book in the George Smiley spy series, the novel feels like more of a standalone work. Here, Smiley is only a minor character, appearing briefly in the story. However, a key character from the first book, Call for the Dead, makes a re-appearance here, and the events of this novel are revisited in the 2017 novel, A Legacy of Spies. The novel was published in 1963, and was adapted as a film, starring Richard Burton, two years later.